The job responsibilities of chief risk officers (CROs) have evolved drastically over the last two decades. CROs are playing key profitable roles is some of the world’s biggest banks. In the face of the global financial crisis, risk departments, particularly CROs, are handling many more tasks apart from what they were managing twenty years back, like modeling credit and market risks and avoiding fines and criminal investigations. The list of responsibilities entrusted to the CROs has grown exponentially since the last two decades. Operational risk that are quantifiable through capital necessities and penalties for nonconformity was actually developed from a set of unquantifiable ‘’other’’ risks. In the present times, cyber risk has become one of the most pressing global problems that the risk departments need to cope with. The number of cyber hacks is on the rise, wreaking havoc on daily lives as well as social settings. For example, Bank of America and Wells Fargo were among the major institutes hit by the DDoS attack of 2012. It is one of the biggest cyber attacks till date, which affected nearly 80 million customers. In 2016, Swift hack was only a typo away from disrupting the global banking network. ‘’What is called ‘operational resilience’ has spun out of business continuity and operational risk, financial crime, technology and outsourcing risk- anything with risk in the title, somehow there is an expectation that it will gravitate to risk management as their responsibility,’’ says Paul Ingram, CRO of Credit Suisse International. The array of responsibilities for a CRO is so immense, including regulatory compliance, liquidity risk, counterparty risk, stress-test strategy, etc, that it is imperative for the CRO to be a part of the board of directors. Previously, CROs reported to finance director; now they are present on the board itself. They are playing crucial roles in forming strategies and executing them, whereas around two decades ago they were only involved in risk control. The strategies should be such that the capital allocated by the board is utilized optimally, neither should the limits be exceeded nor should it be under-utilized. CROs add value to the business and are responsible for 360 degree risk assessment across the entire bank. Banks are tackling problems like digital disruption, rising operational costs and increased competition from the non-banking sector. CROs play a crucial role in helping banks deal with these issues by making the best use of scarce resources and optimizing risk-return profiles. ‘’Since the crisis, CROs have had their hands full implementing a vast amount of regulation,’’ says BCG’s Gerold Grasshoff. However, regulation has almost reached its apex, so CROs must now use their expertise to bring in more business for their institutions and help them gain a competitive advantage. CROs need to play active roles in finding links between the profits and losses of their businesses and balance sheets and regulatory ratios. Risk departments were once the leaders in innovations pertaining to credit and market risk modeling. They must utilize the tactics that kept them at the forefront of innovation to help their institutions generate improved liquidity, asset and fund expenditure metrics. Their skill in spotting, checking and gauging risk is essential to provide risk-related counsel to clients. Risk departments can team up with Fintechs and regtechs to improve efficiencies in compliance and reporting sections and also enable digitizing specific risk operations. Thus risk departments, especially CROs can add a lot of value to the banking infrastructure and help steer the institutes forward. Credit risk modeling is an essential part of financial risk management. 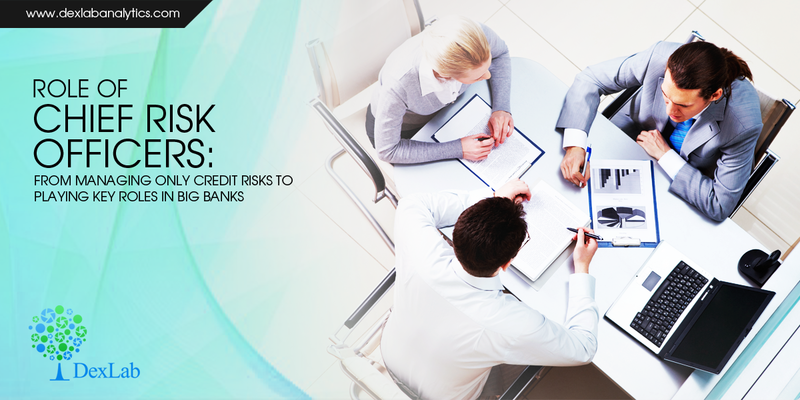 To develop the necessary knowledge required to model risks, enroll for credit risk analytics training at DexLab Analytics. We are the best credit risk modeling training institute in Delhi.